The University of Florida Department of Restorative Dental Sciences welcomed Angela Wong, D.M.D., as a clinical assistant professor in the Division of Prosthodontics on August 20, 2018. Wong, a Fellow of the American Academy of Maxillofacial Prosthetics, will be primarily providing didactic, preclinical and clinical teaching to predoctoral and graduate students, as well as providing prosthodontic and maxillofacial prosthetic care in the college’s faculty practice. Wong attended Canada’s University of British Columbia in Vancouver, British Columbia, for her undergraduate and dental education, earning her dental degree in 2009. Her postgraduate training includes a general practice residency, and a diploma and a master’s in prosthodontics all the University of British Columbia. She then completed a fellowship in oral oncology and maxillofacial prosthetics in Houston, Texas, at the University of Texas MD Anderson Cancer Center in 2016. 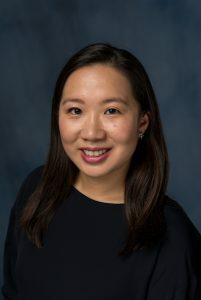 Wong worked in private practice from 2009 to 2013, and also has years of teaching experience at the University of Texas and the University of British Columbia where, most recently, she was on faculty as a clinical assistant professor. She is an Associate Fellow of the American Academy of Maxillofacial Prosthetics and a Fellow of the Royal College of Dentists of Canada where she is also board certified in prosthodontics. Her research interests include quality of life and symptom burden of head and neck cancer survivors; prosthetic versus surgical reconstruction of patients undergoing resections of craniofacial structures (post-maxillectomy, mandibulectomy, facial resection); prosthetic and surgical reconstruction of gunshot wounds/trauma; and 3D printing of maxillofacial prostheses. If you would like to make an appointment for your dental care with Dr. Wong in our Faculty Practice Center, please call 352-273-7654.